The PlayStation Move controllers for PS3 are now shipping through Amazon, Walmart, Best Buy and other retailers. I've played a number of games using Move and think that most PS3 owners will really enjoy them. If you're not familiar with the PlayStation Move, the concept is similar to the Nintendo Wii—wireless controllers with built-in position detection and accelerometers replicate the motion of your hands with movement on the screen. However, since the Move uses a PlayStation Eye camera to track movement, it is also able to recognize more dimensions of movement, including the wand moving closer/farther from the screen and wand rotation. The camera can even recognize your head position, enabling games to track full upper-body movement. In my testing, the extra motion detection provides a greater sense of realism than Wii and, I think, will appeal more to older gamers (ages 10+). You can watch me playing the Sports Champion Gladiator game in the video below—one controller is used for the weapon and another for the shield. 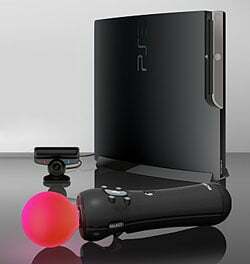 For PS3 owners, Sony is offering a PlayStation Move "starter pack", with one controller, the PlayStation Eye camera and the Sports Champions game pack for $99.99. To take full advantage of the PlayStation Move's capabilities, you'll want to buy an extra control wand ($49.99), for multiplayer and dual control games, and the PlayStation Move Navigation Controller ($29.99), for first-person shooters. If you don't already own the PS3, there's a bundle pack with a PlayStation 3 320GB System with thePlayStation Move Bundle.